So, it seems that pumpkin season is getting longer and longer. Pumpkin Spice fans can barely wait for September to be packed away before all of the coffee offerings and recipes start emerging. 1. Sweater Weather (a good friend dubbed this one, and it stuck – what girl doesn’t love comfy fall sweaters. Not quite cold enough for a jacket. Apple picking in a sweater, morning walks in a sweater. Ahhh. Love it. 2. Soup Season is ON!!! I love love love soups. They are so incredibly nutritious, easy to make ahead and freeze, economical, and easy on the digestive system. This soup recipe was introduced to me by a friend last fall. I have slightly modified it, and it is one of my top faves. I hope you enjoy it. It is full of vitamins, protein and fibre. Lentils are rich in protein and fibre. They are considered ‘pulses’ and are part of the legume family. 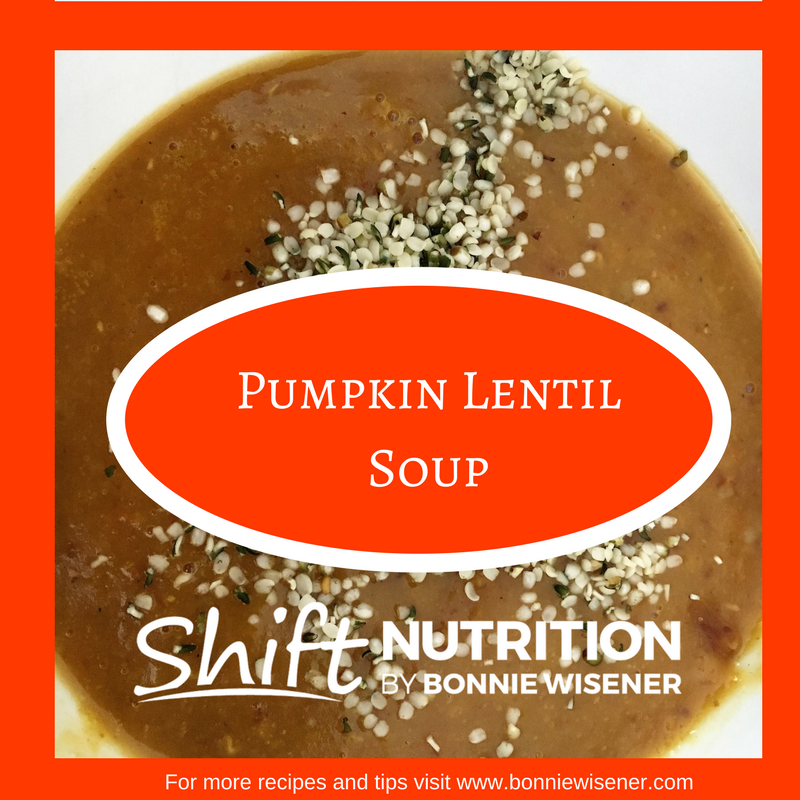 Pair them with Pumpkins and you have a soup rich in Vitamin C and Vitamin A, tryptophan (hello amino acid that helps make happy neurotransmitter seratonin! )not to mention the rich minerals zinc and magnesium. Oh, and did I mention how incredibly delicious this soup is? Make a huge batch and freeze some for those days when you may not have time to cook. Sautée some onion, garlic, ginger in coconut oil. If you are looking for more pumpkin recipes, check out this ‘shifted’ Pumpkin Spice Muffin recipe – beware – these healthy muffins are so delish, they will be gone before you know it. You may want to consider doubling the recipe. These also freeze well. Click below for recipe. Now that we have established that it is… SOUP SEASON (!!!! ), download your copy of my e-book Savoury Soup Recipe Collection and discover 5 Shift favourites. Click link below for access to my e-book and download your copy today. Enjoy all of the comforts that Fall has to offer – from sweaters to soup!